Worked a retail storm with and for Joe. Impeccable eye for detail and great with customers. Runs a well organized shop and has the skills to fix any damage. I would recommend him to any shop that needed a quality tech. Joe Richards worked 2 months for me in Roebuck,SC in 2016. Joe is professional and knowledgeable in all aspects of hail damage repair. Joe can repair large hail dents, works long hours, is dependable and can put the work out. He works very well with others and is very helpful. I will use Joe again and highly recommend him. Joe Richards has repaired hail damaged vehicles for us for a number of years. He is able to repair large damage. 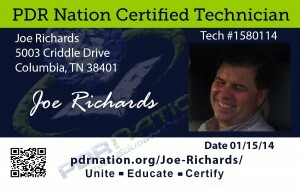 I highly recommend Joe to any one needing PDR work done. Joe Richards worked for me in Atlanta in 2013. First, Joe was completely hassle free for me. I didn't have to go behind him, babysit him, or deal with even one problem from his work. The hail in 2013 that hit the airport, and south Atlanta was large. Joe can flawlessly repair very large hail. He is meticulous and careful, and he cares about his work. He can run a body shop situation seamlessly. I would use Joe again in a heartbeat, and would highly recommend him.